Last year, Raymond E. Feist brought his Riftwar Cycle to a close with Magician's End. In my review of that work, I noted that the book was disappointing only in being the final tale in a grand saga I first started reading as a teenager and that its only flaws lay in it not quite covering every detail of that saga in its final summation. By contrast, Midkemia: The Chronicles of Pug is a disappointment on nearly every front. Co-authored with Stephen Abrams (the game-master who created much of the world of Midkemia for a home-brewed RPG campaign that Feist later utilized for his books), I would like to say that the book tries too hard to be too much. I would LIKE to say that but the truth is that - as with many of Feist's later novels - it feels like the bare minimum of effort was put into this book's creation. It is true that this book attempts to be both an atlas and travel guide for the world of Midkemia as well as a history of the world as seen through the eyes of the sorcerer Pug of Crydee. But the flaws with this book have nothing to do with it overreaching its goal and everything to do with sloppy editing. A prime example of this slapdash editing can be found in the List of Characters at the start of the book. For some strange reason, a listing is given for a son of Arutha conDoin who never existed (Lyam II) and the name of one of the most prominent heroes in the series - Erik von Darkmoor - is mispelled Eiek von Darkmoor. A more disturbing problem is that few of Feist's female protagonists are mentioned in this list of important characters, particularly heroines from his later novels like Sandreena the Knight of Dala and the spymaster Lady Francizeka. Yet both of these heroines are notable enough to have pictures devoted towards them... though Francizeka's name is misspelled Franziska! I could go on at length about the number of continuity errors and spelling mistakes in the text and how the maps themselves are inaccurate. One map, for instance, depicts the city of Port Vykor (or Port Vikor, depending on which map you look at) as existing some fifty years before it was founded. Another map is said to be a gift from Earl Vandros who was, at the time that map was said to have been made, a Duke. Even Pug's recounting of his own life is filled with errors to a degree that cannot be written off as the fault of memory over the years or Pug being an unreliable narrator. Indeed, Feist plays with this concept a bit, starting chapters with Pug chiding himself for not discussing some detail in the previous chapter which he really should have mentioned before. Feist further expands these sections with notes by Pug's son Magnus, who adds his own thoughts on his father's state of mind at the time each chapter was written. The most vexing thing about this narrative is that Pug avoids offering any personal insights into many of the events he discusses and writes, to borrow a phrase from the first Raymond E. Feist novel I ever read, "with all the passion of a scribe doing year-end tax tallies." He avoids discussing personal matters in his recanting of the history of his world, leaving Magnus to chime in about how certain events occurred after certain characters died and how upset he recalls his father being at those times. The aforementioned artwork of the book is another sore point. 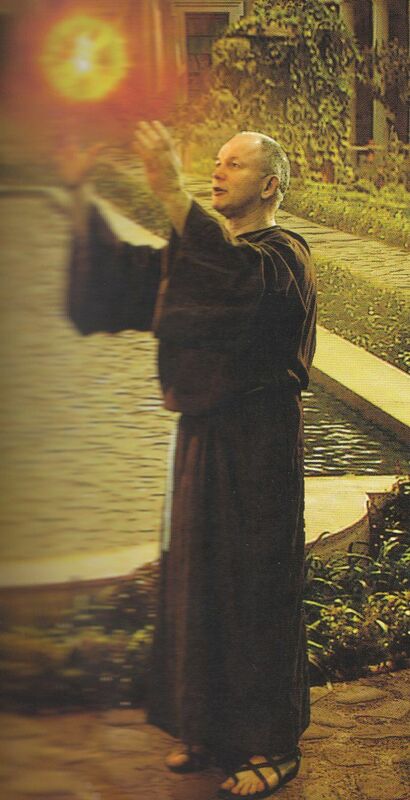 Described on the dust jacket as "thirty pieces of specially commissioned artwork that bring key moments in the Chaoswar Saga to vivid life", the artwork is comprised of a series of poorly Photoshopped images of actors in Renn Fest clothing inserted into generic fantasy backgrounds. One wishes they had used Smithmicro Poser or a similar program instead of live actors so there would be a chance of the characters matching their descriptions in the book. For instance, here is the sole image we have for the sorcerer Macros The Black, described within Pug's recollection in this book as "... grey-haired at the temples with otherwise long, dark locks... with deep, dark eyes as he held a sturdy oak staff." No long locks. No oak staff. And those familiar with this scene in Magician will recall that Macros never worked overt magic during the scene depicted. The other images are similarly confounding, with a generic mountain-based castle being given as an example of the fortress city of Amengar from A Darkness At Sethanon and the one scene depicting a dark elf showing a ebony-skinned, white-haired figure like Drizzt Do'Urden when Feist's "mordehel" look just like their pale-skinned, good-hearted "eldehel" cousins but with mad eyes. The selection of scenes depicted defies logic as well, favoring landscape depictions of certain areas rather than action-filled close-ups. The only thing that redeems this book is when Feist and Abrams cease giving us the Cliff Notes version of The Riftwar Legacy and let loose details of other stories we did not see in the earlier novels. Chief among these are an opening section where Pug talks about his life before the events of the first novel and a later one where he discusses the events that were going to make up Feist's unwritten novel Return Of The Buccaneer. There are also some sections where Pug breaks his narrative to turn the history over to figures who were there for events he did not participate in, such as Admiral Amos Trask's recounting of the events of The King's Buccaneer. 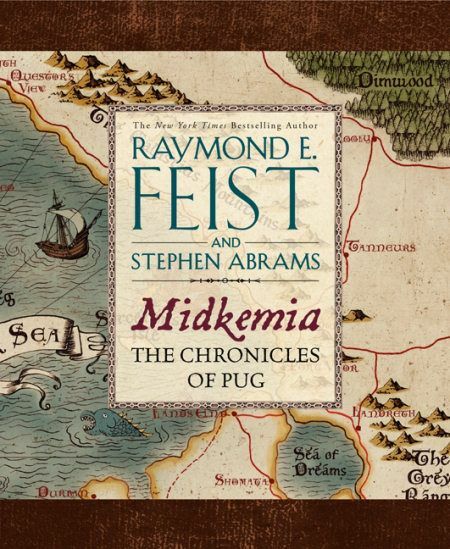 In the end, there is little to recommend Midkemia: The Chronicles of Pug to even the most devout fans of Feist's work. The chronicles themselves offer no new insights on the series and there is very little information on the lands depicted in the maps of the atlas. Throw in some poor artwork and poorer editing and I have no qualms about saying you should pick this book up at the library rather than purchasing it for yourself, if you truly must see it for yourself.